Modular Agenda and Speaker Bio Event Assets are active in SAM, these are functional on mobile only. Agenda and Speaker Bio Events assets are active in SAM, for more information please contact interact technology. General Data Protection Regulation (GDPR), SAM has been made compliant as set by the regulations. Smart Library Folders - Smart Library creation now has a fourth tab added called "Folders and Ordering", this allows for content to be assigned to specific folders. Privacy Fields are a optional and configurable feature that can be added into SAM. If added this will show up in the app as "View Privacy Contact Details"
Use of hyperlinks to directly launch a specific piece of content within myINTERACT. This is now available from the Daily Email Newsletter and can also be used in emails/eDM campaigns, websites or anywhere you choose to offer a link to drive users directly to your content. Click here for more information on deep linking. Support for Microsoft Office: In order to guarantee that images, fonts and styling will be retained, we have removed support for xls, xlsx, doc, docx, pptx, and ppt so please convert to PDF before uploading to Smart Libraries. File size: Now limited to 500mb per file to ensure seamless download process for end users. Folders: Ability to create folders within smart libraries and order content within each folder further increasing the utility of the this asset. This update is currently available in SAM but will not available in the end user application for approximately four weeks. A release note will follow once available. Smart Library Reporting - Reporting on Smart Library usage has been implemented into SAM for SAM Administrators to run as required. 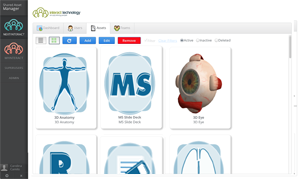 Smart Library Asset creation is live. This allows for a range of content to be shared with connections and user and also allows for those connections and users to add their own content to the library if granted the role. The ability to create Private Folders in nextINTERACT only is live. This allows for sensitive content to be made available to a select list of users who have access granted to the private folder. Reporting can be configured to filter out specific connections or users if the specific connection or user has been configured to be discounted from the reporting. Event Teams have been configured to assist in defining content for events with multiple categories. Customisable QR Codes have been configured to work in conjunction with Event Teams for defining the attendees in to the specific categories. The option to import attendees from other event has been added to allow for attendees to be added en-masse. Completing this will give the option to choose the specific event team for the attendees. If you would like more information regarding these changes our friendly support team is available by sending an email to support@interact.technology or contact your Account Manager for more information. SAM now has an option whereby a myINTERACT wall can be configured to have all content password protected. Assets are able to be assigned to individual Users/Connections through SAM, this allows to limit access to assets to specific people rather than teams. "Password must be at least 8 characters and include 1 uppercase letter, 1 lowercase letter and 1 number"
Push notification functionality has now been added on a per asset configuration. We are pleased to announce that the long-awaited Events functionality is now live and any symposiums, conferences, forums, etc. can now be configured and executed end to end in the myINTERACT application through SAM. To make it easier to find a relevant report, all reports and descriptions have been updated. Report numbers remain unchanged and reports are still available via the [Admin] tab in SAM. It is now possible to access multiple SAMs under one login. 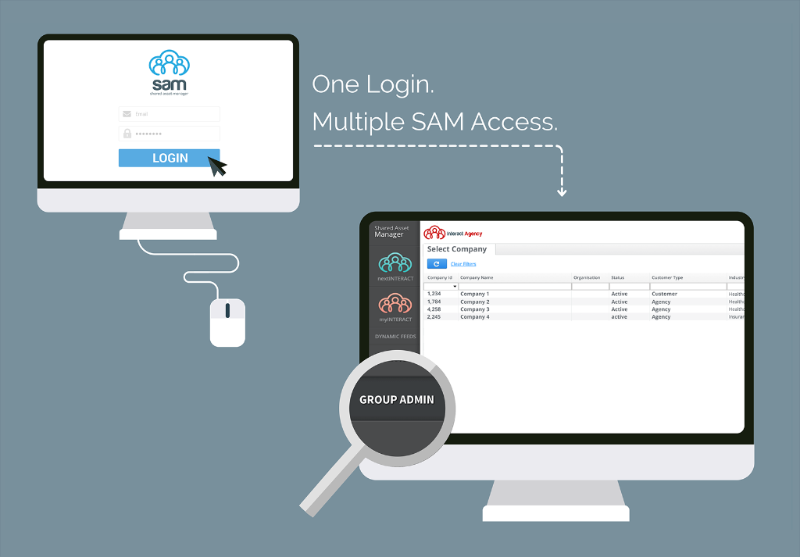 The Group Admin features enables administrators to access multiple SAMs under one login providing faster and easier access to all company content across divisions and regions, without the need to remember multiple login and passwords. For more information, or to enable this feature across your accounts, please contact your Account Manager directly or contact INTERACT Technology by email or phone 1300 77 82 84. These can be accessed under the [Admin] tab. 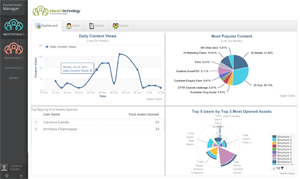 We are pleased to announce that we have added new reports to SAM for nextINTERACT and myINTERACT. These can be accessed under the [Administration] tab. nextINTERACT User List: a CSV export of all nextINTERACT users in your SAM. This is particularly useful if you need a list of all users. User Performance Report: A report showing the number of assets opened and the total time these were opened in the selected period of time for every user. Brochure Inventory Report: Ever wondered if you users have the correct asset version downloaded? This report will give you detailed information which asset versions are loaded on a user's iPad. myINTERACT Connections List: a CSV export off all myINTERACT connections. This report includes all contacts, invite status, date invited, date registered, connection created by and much more! What Material Did My Connection Look At: a CSV export of assets opened by a single connection. When following up on a sales pitch this is the report you want to run to see what material your connection looked at in a given period of time. It will also display the amount of time each material was opened. Top Connections By Company: A report showing the number of assets opened and the total time these were opened in the selected period of time for every contact in your myINTERACT account. Top Connections By Team: A report showing the number of assets opened and the total time these were opened in the selected period of time for every contact in a specific team. Choose from 50 new images for the tile of your content. SAM Online Asset Packaging (SOAP) tool now has an image gallery. We are pleased to announce that as part of our ongoing platform enhancements, we have released a great new feature called an image gallery. It is now possible to package up your content for myINTERACT and select an image for the tile on the wall. The gallery offers over 10 categories of images and we will continually add images to ensure your wall remains fresh and unique. Log in here and see how easy it is to create your own wall on myINTERACT. As always, our friendly support team is available to help you - support@interact.technology. As of 13th May 2012, the nextINTERACT CMS supports integration with Dropbox meaning you can upload brochures and skin files directly from single or multiple Dropbox accounts. Faster uploads. e.g. A 50Mb file takes around 14 seconds to upload. Greater collaboration amongst creative teams sharing files between agencies, graphic designers, and developers etc. Flexibility to choose your file upload method 1.) Local file; or 2.) Dropbox file. Time-savings by not needing to upload files into two systems. To get started using Dropbox, simply login to the nextINTERACT CMS (Company Admins only) and define your Dropbox account using the [Dropbox Management] link. You will be requested to first authenticate to Dropbox, and then accept the [nextINTERACT CMS] Dropbox App request which gives the CMS permission to access the files in your Dropbox. Once setup, you can upload files from Dropbox to the CMS by selecting the [Upload file from Dropbox] option.